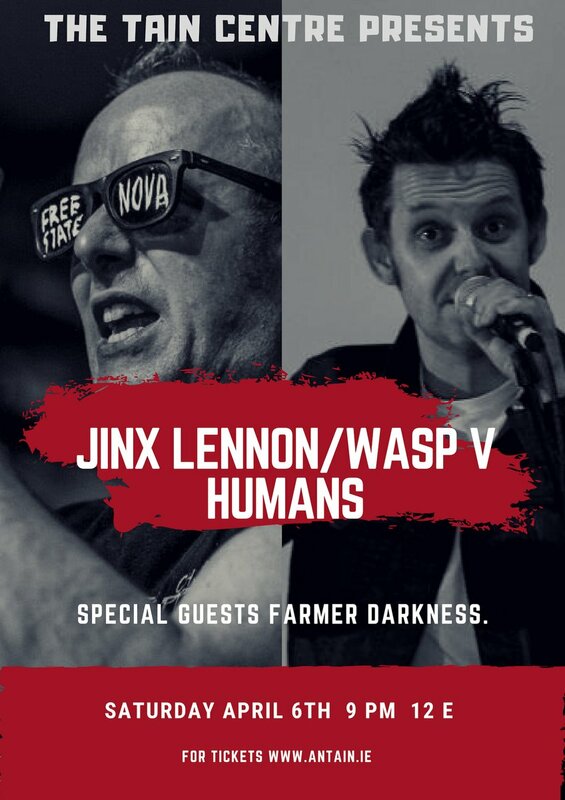 This Saturday night sees the appearance of one of Dundalk's greatest heroes, punk poet Jinx Lennon, at An Táin Arts Centre for what looks set to be one of the most exciting gigs to happen in the town this Spring. Appearing with Jinx on the night is the wonderful beat poet Carl Plover AKA Wasps V Humans, originally from Grantham in the UK, the home town of the brilliant Sleaford Mods. Dundalk is well represented on the night, with local act Farmer Darkness also set to perform. Formed by Emer Mc Ginnity and Meabh Breathnach, Farmer Darkness have a DIY punk ethos and sharp sense of humour, their debut release, "CD" is on sale now in Classified records in Dundalk. Tickets for what is shaping up to be a brilliant night, are €12 and are available from www.antain.ie or you can pay at the door. Doors open on the night at 8 pm. Jinx is currently working on his 10th record, the working title of which is ''At last ........The Border Schizo Cosmic Folk Sound''. According to Jinx, it will be a "double album with 30 tunes which I have recorded with Silverbridge musician Ben Reel. Dundalk features in a lot of the new songs like ''Sneachta'', "The Manhole Covers of Dundalk Town", "The Friend of The Ice Cream Machine'", "Live North Louth'' and ''Pushin the Patients Round''. "Grow a Pair!!! again confirms Lennon as one of the most idiosyncratic and singular talents in this country. Jinx is never afraid to sing in his own accent, or address the personal and political, and every shade of grey in between, while empowering the listener throughout the whole beautiful process." To keep up to date with gigs and new releases from Jinx Lennon, follow his Facebook page here.